AWS Lambda is one of the fastest growing services of AWS! 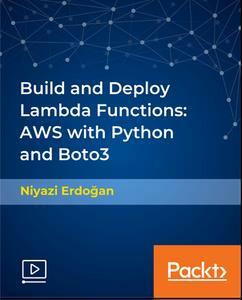 This course is part of a series of courses on AWS solutions with Python and Boto3 and now it's time to implement serverless functions! AWS Lambda is a cornerstone service for serverless architectures on AWS. You do not manage an infrastructure like CPU, memory, OS or patches you name it! All you have to do and worry about is your implementation and code! Let's take a closer look at what we're going to cover in this course step-by-step. In this course, we will start off with what we'll build throughout the course and what you need to have on your computer to follow along with me. Don't worry; I'll explain everything you need very clearly and I'll show you what you need to install and setup on your computer to work with AWS Lambda. There will be two different sections for Windows and MacOS users. These sections are basically identical and show how you can prepare your computer environment to be ready to work with AWS Lambda! I'll show you how to install Python, Boto3 and configure your environments for these tools. I'll also show you how you can create your own AWS account step-by-step and you'll be ready to work AWS in no time! When we're done with preparing our environment to work AWS with Python and Boto3, we'll start implementing our solutions for AWS.